The link between blindness and musicianship is so strong that a legion of American blues singers adopted “Blind” as a nickname: Blind Willie McTell. Blind Boy Williamson. 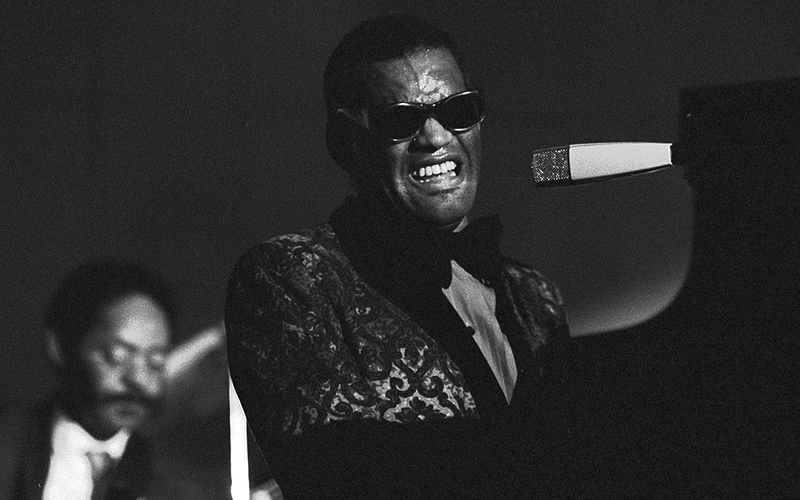 Many blind musicians reached the pinnacle of their fields. Pianist Art Tatum, for example, or singer Stevie Wonder. Scientists have known that the brain regions that normally support the lost sense of vision can be press-ganged into serving a surviving sense, like hearing. Musicians who were blind from birth, or at a young age, are renowned for awesome memory of songs and perfect pitch. Age matters. Early in life, during the “critical period,” the brain has astounding ability to make changes and connections that are necessary for many types of learning. Afterwards, not so much. Now we learn about hearing improvements in mice that, having left the critical period, lived one week in darkness. To document the effects, scientists measured changes in connections between different parts of the brain needed for hearing. Auditory impulses travel a complex route from the ear to the auditory cortex, where they are interpreted as sound. Research in mice shows that temporarily shutting down the visual system can enhance accuracy and sensitivity in the hearing system. 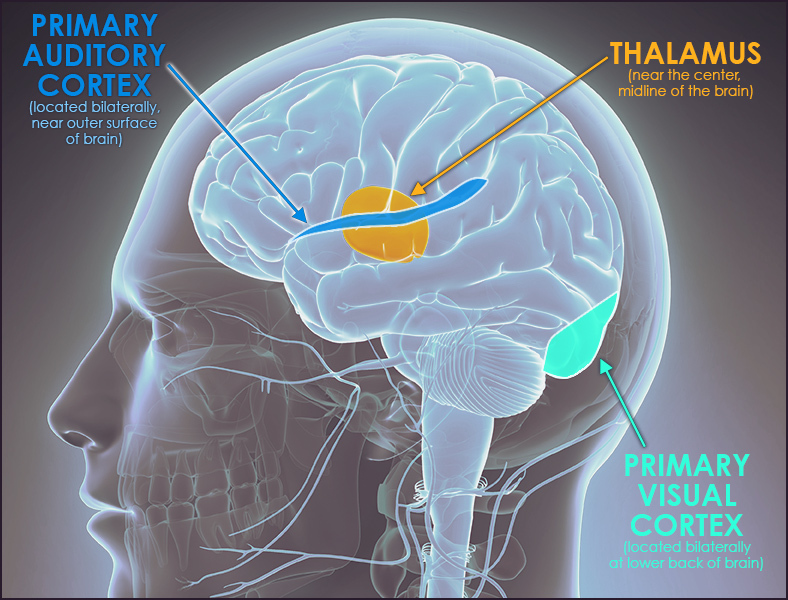 Modified from original Thalamus illustration from Shutterstock. Neuroscientists use “plasticity” to refer to changes in the brain as a result of training or experience. By recording electrical activity in the brains of mice, the researchers monitored connections, called synapses, between the thalamus and the cortex — an essential transition point for auditory impulses moving from the ears deep into the brain, where they are interpreted as sound. As the synapses between the thalamus and cortex change, “the flow of information into the auditory cortex is increased,” Kanold says. Specifically, the experimental mice became able to distinguish among different pitches, between pure tones of 8,000 hertz and 8,050 hertz. “Neurons in the normal mice can’t discriminate that, but the dark-raised mice can distinguish it; and they are also more sensitive to soft stimuli,” says Kanold. Think you hear better than the test mice? Press the buttons and check it out! Finding flexibility in the brain of a mature mouse just by turning off the lights for a week is significant. Could a technique based on temporarily restricting vision help people who have difficulty understanding speech in a noisy restaurant, locating the source of a sound or enjoying music? Although we began with the extraordinary auditory abilities of blind musicians, the present study shows a related but different phenomenon. In blind people, visual areas of the brain begin to serve other functions, Kanold says. “When they read Braille, the visual cortex is active. We find hearing function is improved” because the auditory cortex has been altered by changes in the visual realm. And that suggests a possible end-run on rehabilitation, he says. Many therapies are focused on the system that is deficient, “but maybe that’s not the best way.” Maybe it’s possible to “open some space” in the brain by changing a different sensory system, he says.